Even if you aren’t celebrating Valentine’s Day, you may just love these colors as much as I do and should definitely sew it up. Either way, this project is a great way to spend your sewing time! Not only is this quilt just stunning to look at, but it’s stunningly easy to do. There’s a free pattern included with this video tutorial that you can get ahold of by clicking here. 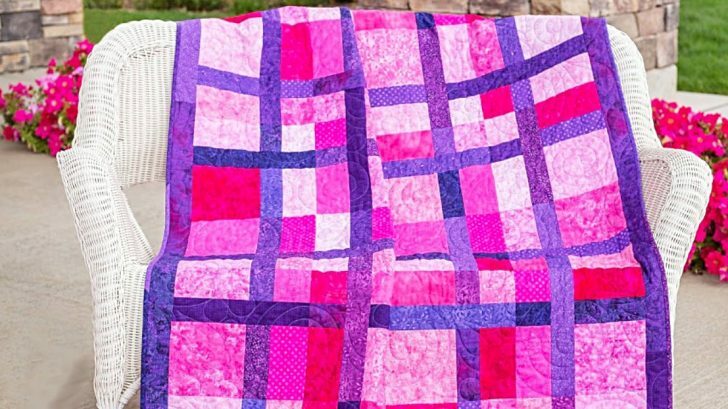 Now that you’ve got a pattern AND a video tutorial to work with, let’s get stated with the quilt! As you can see by looking at the final project, the majority of the quilt is made with 4 patches and sashing, with the outer edges made up of two pieces of fabric instead of 4. If you take a look at the sashing, that’s also multiple different types of fabric– but don’t let the look of it scare you. When you separate the blocks and sashing into 2 tasks, it’s much easier to do. Use the pattern to get the exact measurements needed for the sashing and blocks. Then, start by sewing the blocks. Surround the blocks in the accompanying sashing, patching it together as you go. Once you finish that, you’ll have a completed quilt top. Just add your batting, a backing fabric, and any other finishing touches you’d like. Now you have a completed quilt! Watch the video down below and be sure to download the pattern by clicking here. You’re gonna love making this. I know I did!